Renowned for his talent in creating glorious backyard retreats, Deck and Patio’s outdoor living expert, Bill Renter, has earned many accolades for his expertise in the “hows and whys” of construction materials and landscape design. This enables him to create beautiful retreats that will endure. Considering the weather changes the Northeast faces from season to season, year to year, Bill Renter has come to value construction products for their durability as well as aesthetics. Today our blog is sharing two of these products. The first is Techo-Bloc pavers. Engineered in Canada where they require extra strength due to the country’s extreme weather changes, these pavers can well handle the freeze/thaw that occurs in our corner of the Northeast. Our outdoor living expert adds that as long as these pavers are properly installed, the stones will remain adaptable, even, and stable for years. The joints between the pavers create flexibility, which avoids cracking, while still allowing subtle movement. 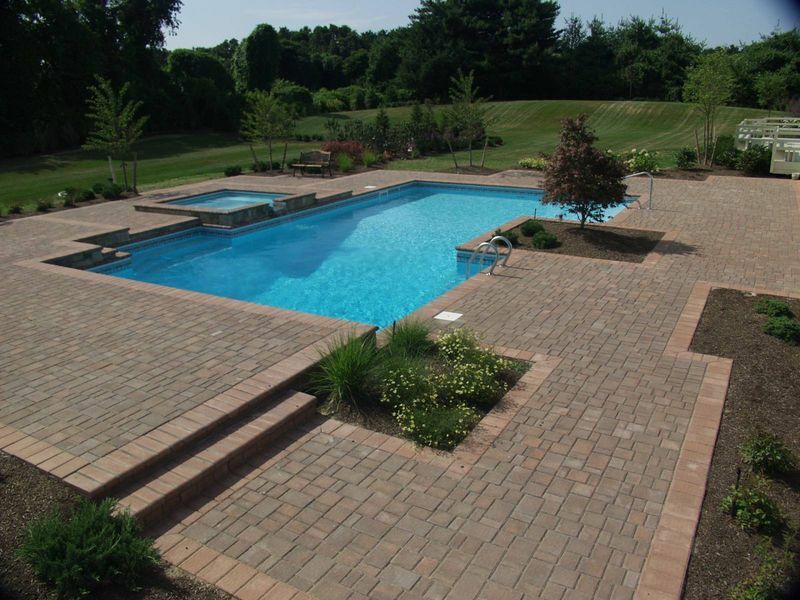 Techo-Bloc pavers are nearly three times stronger than poured concrete, having a minimum compressive strength of 8,000 psi and a maximum of five percent water absorption. Deck and Patio’s outdoor living expert has found that just like concrete and asphalt pavements, Techo-Bloc pavers can be plowed and shoveled. Actually, the edges and joints around the pavers assist in melting snow and ice, explains their manufacturer. Using de-icing salt (sodium chloride or calcium chloride) to remove snow and ice will not harm these paving stones they say. Another reason Deck and Patio’s outdoor living expert loves these paving stones is they look so natural. Instead of one-sized bricks being placed throughout an entire patio, retaining wall, or driveway, a Techo-Bloc kit — with its varying shapes — ensures an attractive design, whether “random” instead of straight lines and flat images or in a “running block” pattern. Using de-icing salt to remove snow and ice will not harm Techo-Bloc pavers, driveways, or retaining walls. For the following Deck and Patio’s project, just outside the house on the upper level of the property, our outdoor living expert replaced the old decking with a new raised Techol-Bloc patio. In addition to a new outdoor kitchen, he added wide wrap-around stairs, and a portable spa that appears to be built into the patio. At the pool level, our outdoor living expert used a new Techo-Bloc product called “Inca” — a concrete slab that looks remarkably like natural stone. 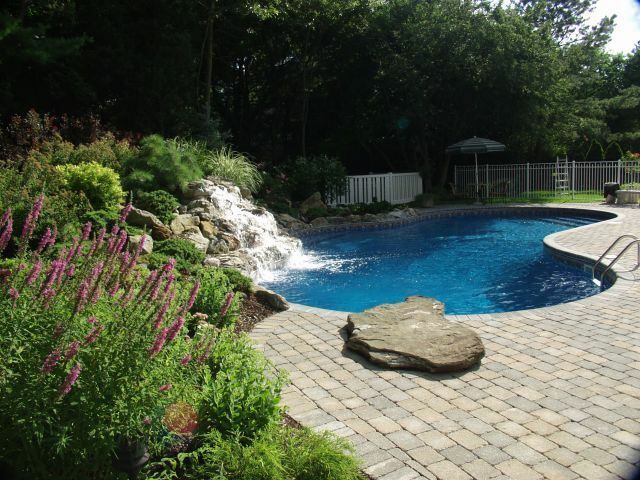 Of course, it is much less expensive than say, bluestone, and doesn’t retain heat in summer like other natural stone products, making it great for use around a pool. Deck and Patio’s outdoor living expert created five different patio levels around this pool — all comprised of winter-friendly Techo-Bloc. The second “winter-friendly” product our Deck and Patio outdoor living expert loves is “vinyl-lined” pools. 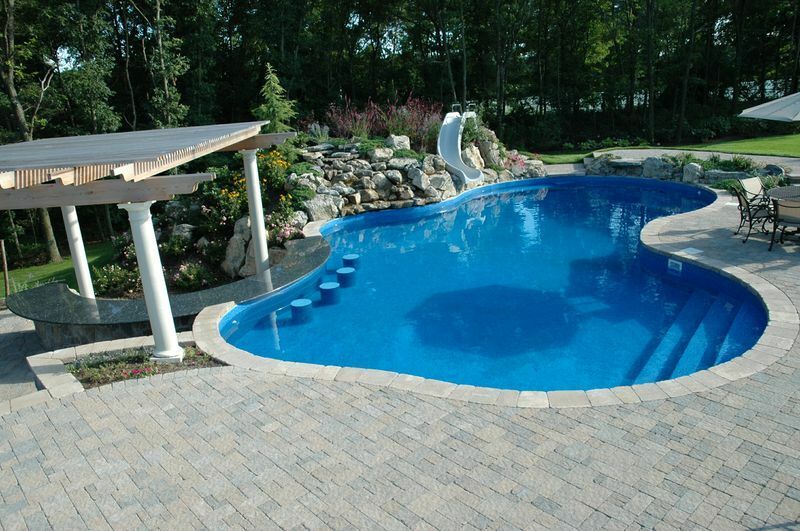 In winter, when seasons change and the ground goes through expansion and contraction, in some cases water can get underneath a swimming pool and push the swimming pool up out of the ground and while Deck and Patio certainly designs and builds gunite pools, we find that a vinyl pool resists damage due to such ground movement better than concrete pools. The base construction of a vinyl pool is the same as any other, however. “Vinyl” simply means the method used to line a pool’s interior. The vinyl-liner pool arrives at the pool site as various components, produced in a factory and assembled onsite. After the pool site is excavated, footings are poured and panel walls are assembled and fastened together supported by the footings. Once the walls are in place, which are a solid 8″ thick concrete, with double steel reinforcement, a vinyl liner is spread out over the interior and connected to the panel walls. If you consider that all the large buildings and bridges in the United States are built with steel and not just concrete and rebar, you can understand why our outdoor living expert believes so much in the product and process. Of course it’s not just the durability of the vinyl-liner system that is so attractive. Our outdoor living expert finds that many of our clients prefer the padded, smooth, soft feel of vinyl. 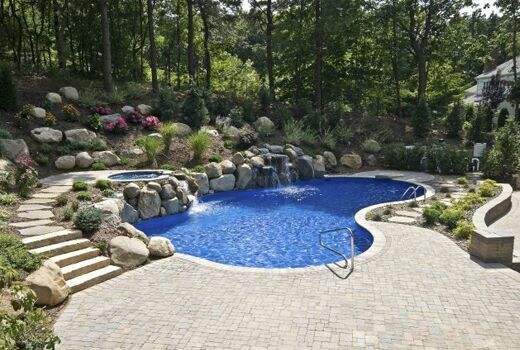 Plus, the wide range of liner colors can create breathtaking effects — some suggesting grottos or lagoons. In fact, there are reports that there are now more vinyl pools worldwide than any other combined group. 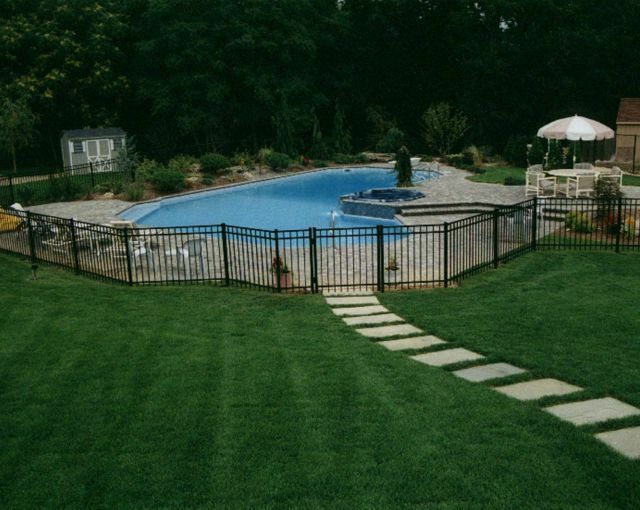 Vinyl pools’ poured steel reinforced concrete indeed stand up to weather changes. The real challenge is measuring and accurately cutting and welding the various pool liners, particularly if you are including stairs, benches, in-pool bar stools, spas etc. Fortunately, Deck and Patio’s outdoor living expert deals with professionals who can handle well such complicated projects. The real challenge for vinyl pools is measuring and accurately cutting and welding the various pool liners, particularly when including stairs, benches, in-pool bar stools, spas, etc. 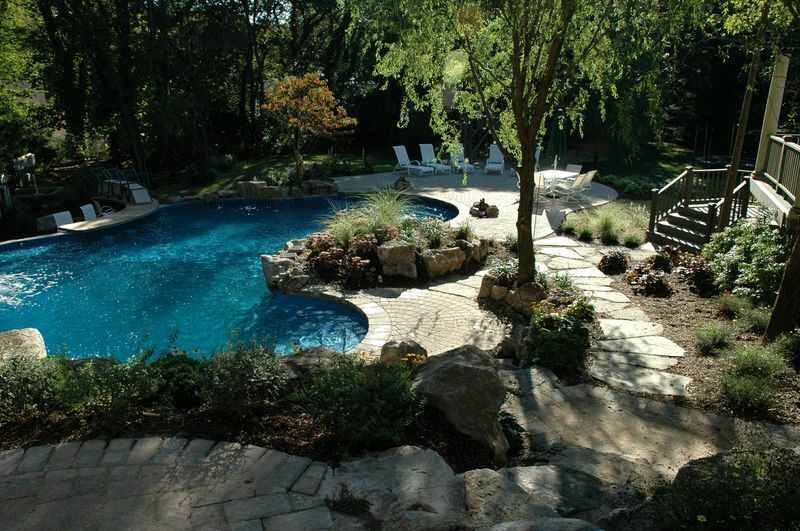 The following vinyl pool was designed with the intent to be “organic” with its natural surroundings. 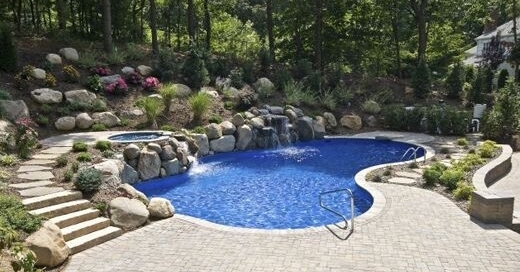 The 24’ x 42’ freeform concrete wall, vinyl lined swimming pool and raised 8’ diameter vinyl-lined spa with spillway captured the very essence of the clients desire to have a body of water that would be harmonious with the residence existing patio, outdoor kitchen area, waterfall, stream and koi pond (below). The water feature also included a 5’ high multi-tiered waterfall and 35 feet meandering stream which discharged into a 10’ x 15’ freeform Koi pond. 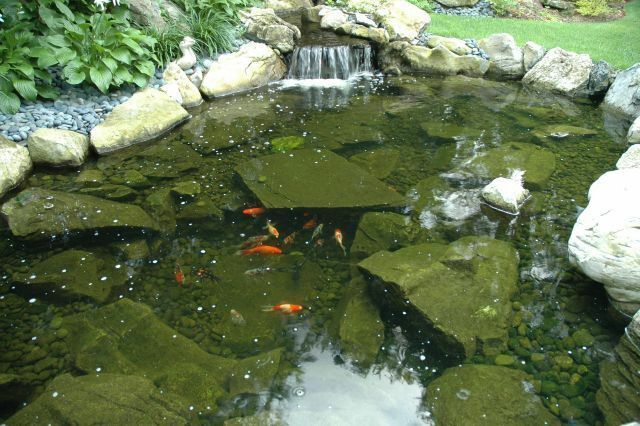 The pond was built with much consideration for the fish as natural predators exist in and around the north shore locale. A small cave was constructed for the fish to hide and to lay dormant during the winter months. It’s a comfort to know that when the koi are hibernating, your concrete steel reinforced vinyl pool is managing through the winter just as well. Rocks are a natural part of nature, and when chosen well and positioned perfectly, they can make a man-made waterfall appear as if it’s flowing from a natural mountain stream. Elsewhere in your landscape, a single, perfectly-sized, durable rock can make a diving board feel like you’re jumping from a small cliff into a Caribbean lagoon. Plus, a group of flat, well placed stepping stones can turn a functional lawn-protecting pathway into a peaceful stroll well worth taking. An avid outdoor enthusiast, Deck and Patio’s own Bill Renter spends as much time as he can walking the hillsides of NY’s Catskills and studying the landscape. His expertise in how rocks affect streams and waterfalls is well known. Over the years, he has received a multitude of awards for choosing the perfect rocks, and artfully installing them to great effect and function. Waterfalls cascading over natural rock creates perfect mood for meditation or romantic al fresco dining. Rocks used here include river rock, moss rock, spill rocks, and bluestone stepping stones. Set against lush landscaping and a beautiful man-made waterfall, this diving rock and paving stone patio feel like they’ve come about organically. 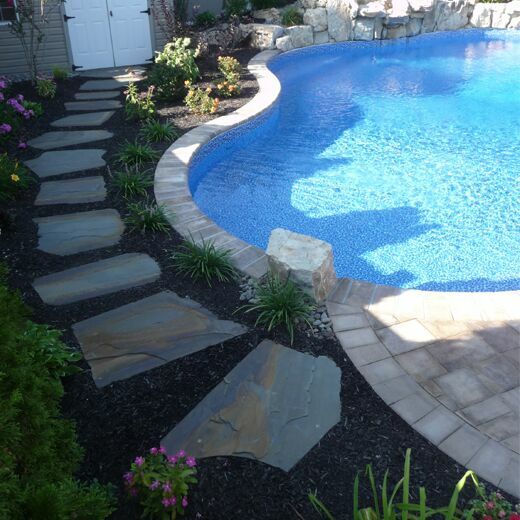 Here rocks have been used to create two stepping stone paths; a natural looking and sturdy set of stairs; a custom raised spa set above the pool, from where a heated waterfall flows; and a retaining wall of natural stones. Stepping stones can be round, square, or irregularly shaped; place them squarely along your intended path. A good deal goes into creating a wonderful outdoor living space. This is true for any artistic endeavor, including something as simple as baking a great loaf of bread. You start with basic ingredients. Then something special is added to make it all rise. For bread, that something special is yeast: in landscape design, it is a passion for the outdoors. When he’s not working 14 hour days as owner of Deck and Patio in Huntington Station, Bill Renter enjoys spending time at his second home in the mountains of upstate New York. There, he enjoys quiet times hiking the mountainous landscape where streams flow into breathtaking natural waterfalls, wild flowers break out of crags and cover expanses. In this still beauty, he takes time to study how the water, plants, soil, and rocks live together. He says that with each such nature walk some fresh inspiration comes to him on how to design and build a new natural looking outdoor space. However, Deck and Patio’s outdoor living expert also understands that passion on its own isn’t enough. Design/build expertise, and depth of experience, is essential (see tips for choosing qualified design/build firms below). In addition, the particular ingredients for each project must come into play: budget considerations, property size and gradations, and the preferences and tastes of homeowners. Once you have all of this working for you, you probably will end up with a very nice backyard retreat. However! If your designer/builder also brings a deep passion for the outdoors, this special “yeast” will raise the routine waterfall to the glorious and a conventional pool surround to the acclaimed. 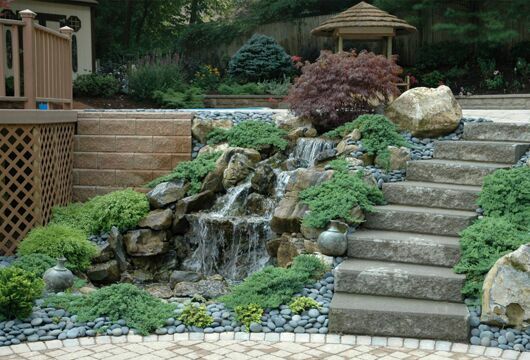 Deck and Patio’s outdoor living expert designed and built this stunning man-made waterfall to appear as if it had been created by Mother Nature herself. This elegant geometric pool and spa, with a linear pattern surround ideal for entertaining and sun bathing, was designed by Deck and Patio’s outdoor living expert to be in perfect harmony with each other. An avid skier and hiker, our outdoor living expert, Bill Renter, has said: “Experiencing nature is life to me.” And despite all the awards Deck and Patio has received for grand projects, much of our work at is done in regular backyards, in phases, and within a modest budget. You don’t have to be on a bluff overlooking Long Island Sound to inspire Bill Renter to create a thrilling outdoor living space that you will want to be in all the time. Bill Renter can create a sublime vanishing edge pond overlooking Long Island Sound; however, most of his work is in creating spectacular outdoor living spaces in regular backyards. Are You Ready To Begin Creating Your Own Paradise? 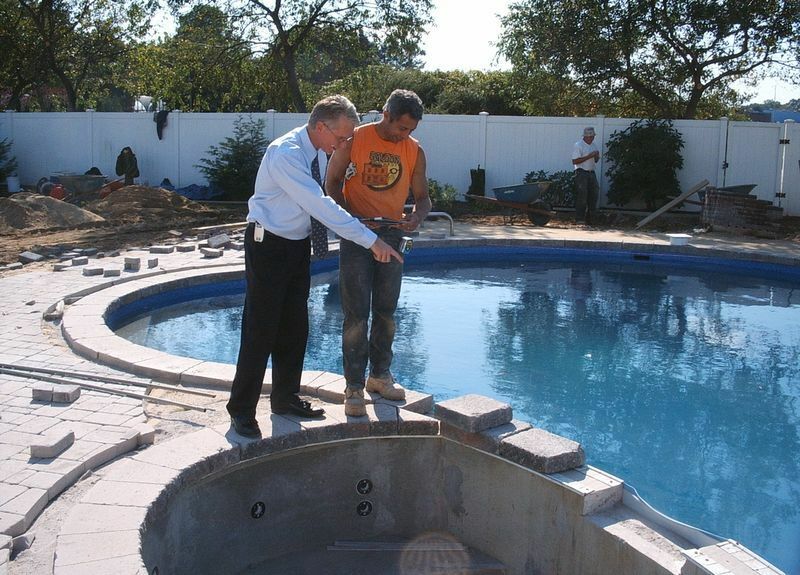 One of the most important steps in achieving your goals for a pool project is to contact the proper type of contractor, warns Bill Renter. He offers here some helpful hints on what to take into consideration when approaching the bidding and design process. 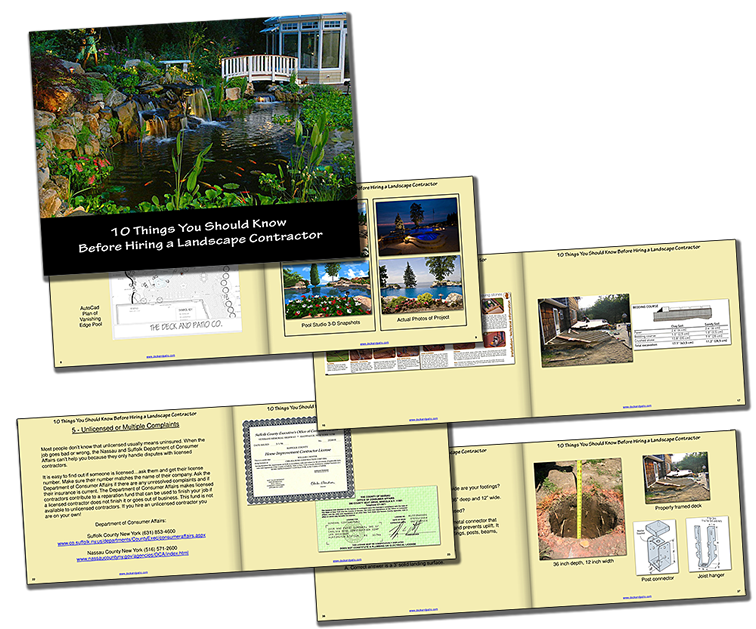 Note: You can also call or email us for a copy of Deck and Patio’s book: 10 Things You Should Know Before Hiring a Landscape Contractor. Deck and Patio’s outdoor living expert offers a free book on choosing the right design/builder for your backyard retreat. Starting early is the best way to get all your ducks in a row. This gives you a chance to plan effectively, square away any variances needed, secure permits and finalize plan details. Another important thing to consider, he adds, is choosing a designer/builder that have insurance and are licensed to work in your area. Ask to see this license and contact your local licensing bureau to make sure it has not been revoked. Ask any designer/builder how long they have been in business. Remember, you are not being overly cautious by requesting this information and your contractor should not hesitate to fulfill your request. Call or meet with three different designers and see how they respond. Unanswered phone calls may indicate poor management or the inability to get someone to respond when an issue arises in the future. Compare bids and pay close attention to details. Many times a cheaper bid is missing many important aspects of the job that when added in will equal the high priced bid. Make sure all specifications, including size, shape, color, brand and quantity are detailed for you. Caption: Choosing The Right Designer/Builder: Call or meet with at least three different designers to see how they respond; compare bids and pay close attention to details. Many contractors utilize the services of subcontractors. Ask your design/building contractor for details about the subs. For example: Are they licensed and insured? Who will be responsible for any repairs necessary for the duration of the warranty? Ask who will be responsible to coordinate the subs and get them on site when the time is right. A good design/build firm will take on the responsibility of coordinating the subs. Find out if you will be responsible for the payment of these subcontractors. Many contractors prefer you deal directly with their subcontractors when it comes to payment and they will step in to coordinate the work for you. Town codes and zoning can be complicated. Make sure your contractor has these guidelines in mind prior to finalizing the design process. Some design/build firms such as The Deck and Patio Company can put you in touch with an expeditor to assist you with the permit process. Inquire about the company you are intending to sign with before going into contract with them. Check their references and ask them how the contractor performed. Ask about job supervision. Find out how many crews you can expect and how many crew leaders and/or project managers will be on the site. Find out how long their crews have been working for the company. Review the contract carefully before you sign it. Make sure all your warranty information matches what you were verbally promised. If anything is unclear ask them to be more specific. These tips, along with our companion book on how to choose the right landscape designer, will help you not make any serious mistakes for choosing a reputable designer. Finding one who also has the “yeast” — or the passion for the outdoors and creating scenes as they appear in nature — is harder. If you can, view some of their previous work, but be sure to compare apples with apples. 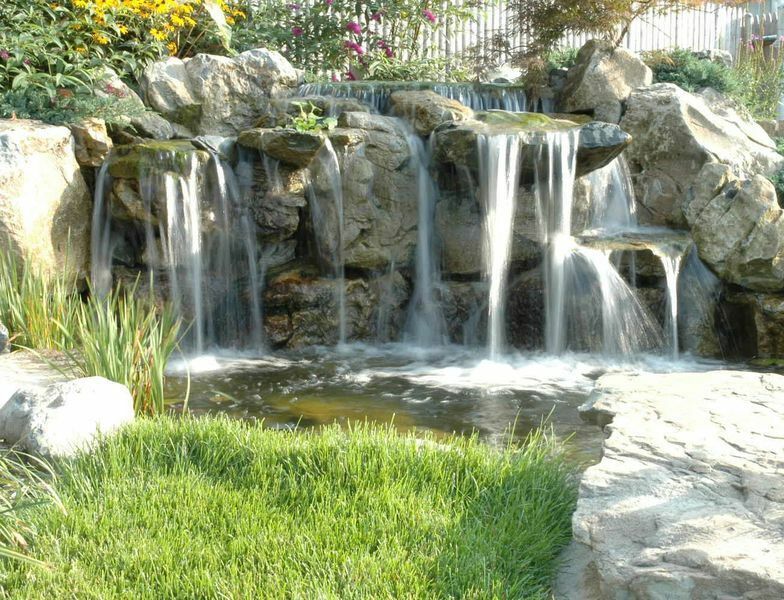 Someone who creates lovely lawns and flower beds might not know how to make a waterfall appear as it comes from nature or a koi pond look like it was always there. With the right designer/builder, you will not need to limit yourselves as to what’s possible. 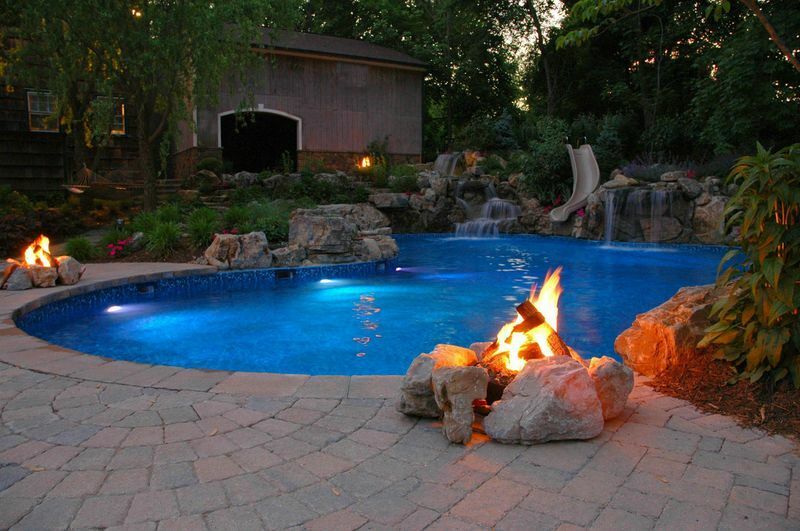 Any backyard, with the right inspiration, can be turned into something spectacular. Indeed, a “regular backyard” (see third photo above), in the hands of Deck and Patio’s outdoor living expert, Bill Renter, became the following South Sea-style paradise, complete with “lagoon” vinyl freeform pool, natural looking bonfire, multi-level waterfalls, slide, and colorful lush plantings. You can almost hear the steel drums.